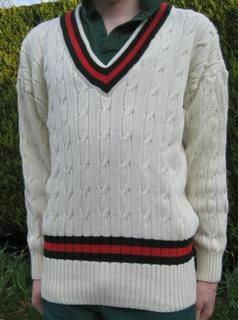 Traditional cream V neck cricket sweater with Wellington coloured red and bottle green trim at the neck and top of welt. Made from Teflon-treated 50% Merino wool/50% acrylic. The Merino Wool gives a soft feel and warmth, the Teflon-treatment adds water-repellency and stain resistance. This garment is also resistant to pilling.